I have now lost two games in a row, to the top two teams in the leagues. My season hangs in the balance of a Week 13 matchup against a team I beat back in Week 3. Both of our teams look quite different at this point in the season. I had the 10th pick in the our draft, while Don Julio had the final pick of the first round in the 12th slot. I went WR/WR while he went WR/RB. I drafted my QB in the sixth round (63rd overall) and he added his in the seventh (84th). I have started Deshaun Watson every week the Texans have played. I went with Ryan Fitzpatrick in Week 11 with Houston on a bye. Watson hasn't thrown for 240 yards since Week 5 but I trust him now more than ever and he has a good matchup against the Cleveland Browns. 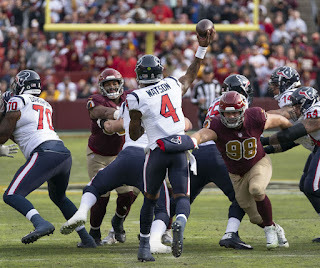 The Texans are healthy on both sides of the football, they added Demaryius Thomas to lineup opposite Deandre Hopkins, they are running the ball efficiently (including Watson) and the defense has allowed their opponent to score 20+ points in just two of the last seven games they have played! 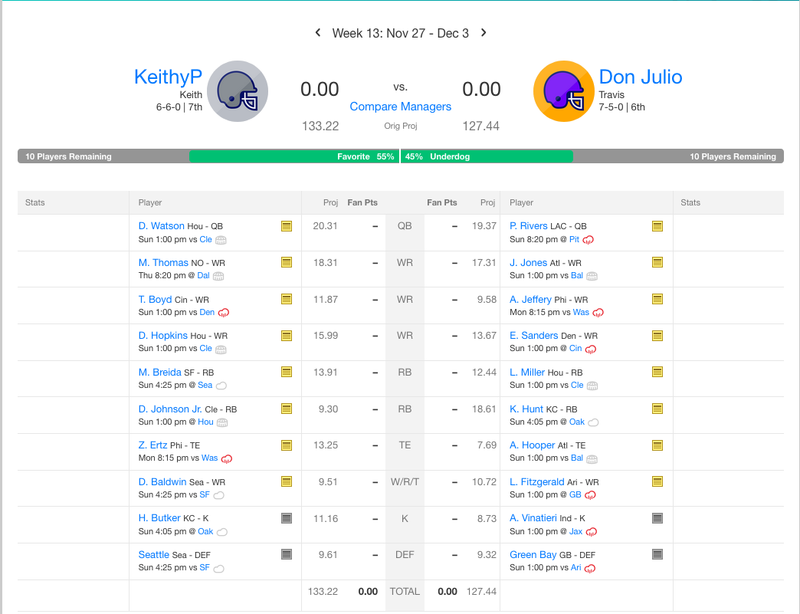 The last time I played Don Julio, he started Matthew Stafford at QB on the road against the 49ers. This week he rolls with Philip Rivers on the road in Pittsburgh against the Steelers, on Sunday Night Football. The Chargers will be without Melvin Gordon, which means Rivers is going to go off for 400 yards and three touchdowns or the Steelers will double team Keenan Allen and force Austin Ekeler to beat them out of the backfield. My running backs pale in comparison to his Kareem Hunt and Lamar Miller(recently acquired in a trade for Kenny Golladay). I went with the zero-RB draft strategy and for a while there was loving my Carlos Hyde/Matt Breida backfield. I drafted Hyde/Breida/Peyton Barber/Duke Johnson/Tarik Cohen between the 5-10 rounds. With Hyde being traded to the Jacksonville Jaguars I have turned to Duke Johnson, but if he doesn't catch passes, he doesn't score points. I sadly dropped Cohen in late September the week before he started putting up fantasy points! In all fairness, the Bears were going to be on BYE the following week. It was a huge mistake and could cost me a playoff berth. What I did do well in this draft was select pass catchers. My first two picks were DeAndre Hopkins (QB/WR stack!) and Michael Thomas. I also drafted John Brown, who had a hot start to the season and I have since replaced him with Doug Baldwin, who I also drafted, in the FLEX position. We play three WRs and that WR3 position belongs to Tyler Boyd, who I added in the middle of September, dropping Cam Meredith. That move has worked out quite nicely and even with Andy Dalton out for the year Boyd is the #1 target in Cincinnati now with A.J. Green still sidelined. He now has Jeff Driskel throwing him passes and they face a Denver Broncos defense that just stymied the Steelers offense. Don Julio does indeed have Julio Jones on his roster. He also has Alshon Jeffery, Emmanuel Sanders and Larry Fitzgerald. Remember when I said I did a good job drafting pass catchers? Well, I also drafted Zach Ertz in the fourth round. A TE that early is not something I normally do but I am glad I picked this year and this tight end to do so! 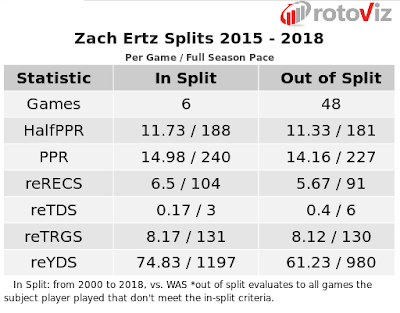 Ertz goes up against the Redskins who have done an amazing job limiting opposing TEs. 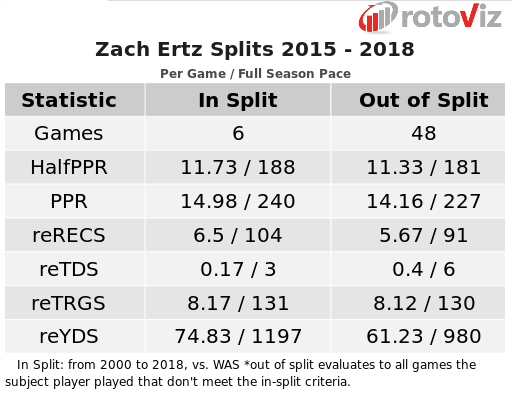 Over the past three years though, Ertz has been able to put up his average fantasy numbers against Washington. Don Julio currently has Austin Hooper slotted in the TE position with a banged up Evan Engram on his bench. Hooper and the Falcons matchup with the Ravens who have also done a good job against opposing tight ends.